this event has come and gone. We will update this page with info about next year's Dew Tour as soon as we have it. Looking for our Upcoming Events? On beach located next to the Ocean City pier. The Dew Tour will return for a fourth straight year in 2014 bringing the best skaters and BMX riders in the world to Ocean City Md. One thing’s for sure. You’ve never been to a Dew Tour this extreme, this intense or this…sandy. 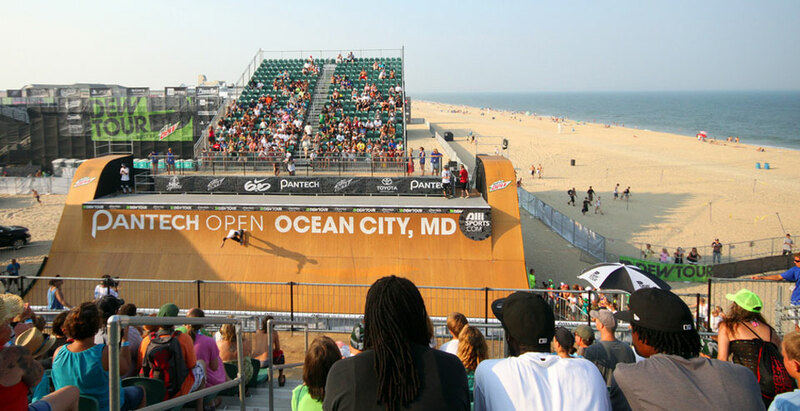 Come June 26 – 29, the 2013 Dew Tour will kick off again on the sandy beaches of Ocean City, Maryland! If you can't make it to Ocean City (Boo!) you can still watch the events on the Official Dew Tour Website (Yea!) …or catch a glimpse of the action from the Plim Plaza Webcam. Here's a full list of events and concert schedules. We'll be posting exclusive pics soon on our blog! Just like last year, the 2014 Dew Tour will be FREE on a first come first serve basis! Clean and comfortable rooms & efficiencies overlooking the beach, boardwalk, oceanfront outdoor pool, pool bar & grill, and children’s playground. An ideal location at the end of the boardwalk so you can spend more time doing the things you love.